Piero's is described as having innovative Continental-American cuisine in a beautiful setting. Anna Lisa traveled with a group of six women to Rancho Mirage, where we stayed at Rancho Las Palmas. We took the 3-minute drive across the street to The River, an outdoor mall, for dinner on a Friday night. We all decided we did not want to visit a chain so we waltzed right into Piero's Acqua Pazza. The decor is very modern and colorful. At the entrance is a large neutral-colored flat waterfall which made the atmosphere inviting. You will walk through a small bar before you arrive in the dining room. The menu was extensive and diverse - - from oysters to quesadillas to calf liver. The dishes were moderately priced and I looked forward to trying what it had to offer. We started with the whole roasted garlic and garlic dip, which whetted my appetite. It was perfect and divine at $8.95. After the appetizer, my party ordered a variety of entrees. 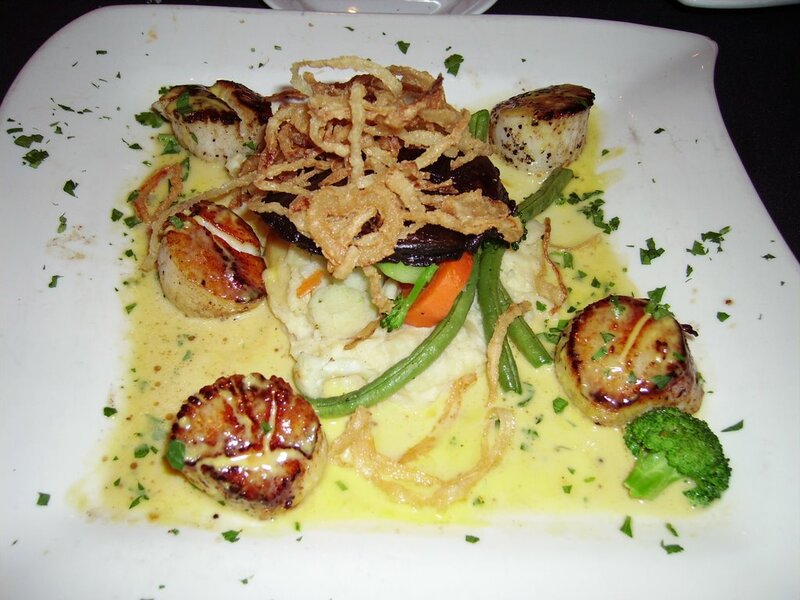 Mine was the Pan Seared Maine Sea Scallops ($21.95). It was served in a mango sauce and a vegetable medley and yukon mashed potatoes. The presentation was lovely and colorful on a white background. The scallops were large and tender. Overall it was delightful - - a tad mild on flavor but worth recommending. 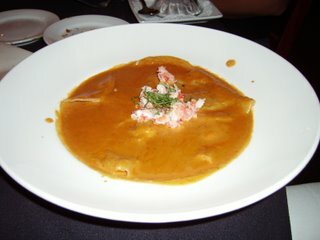 I had a taste of the Maine Lobster Ravioli stuffed with lobster meat and fresh ricotta cheese in a lobster bisque reduction ($20.95). It was one of the two choices I had in mind before ordering. It was flavorful but a bit salty for my taste.